Wellington: New Zealand Prime Minister Jacinda Ardern said she will change gun laws as the country reels from a terrorist attack at two mosques that left 49 people dead and several still fighting for their lives. In what Ardern has described as a well-planned terrorist attack, a shooter walked into a packed mosque in the South Island city of Christchurch on Friday afternoon and opened fire on worshippers, filming and live-streaming the act to social media. After killing 41 people there, he drove to another mosque and continued the massacre, murdering a further seven people. Another person died in hospital. 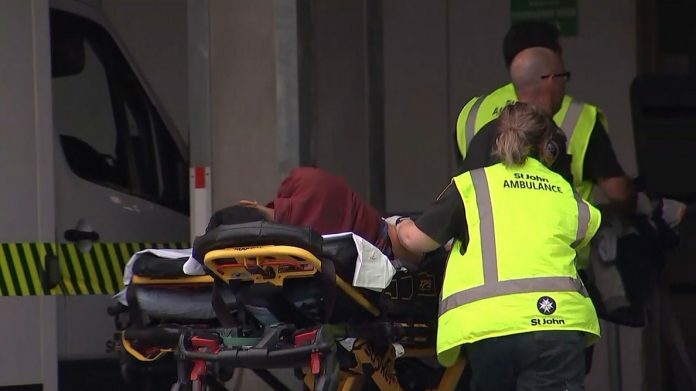 Christchurch hospital is treating 39 injured people, 11 of whom are in a critical condition, chief of surgery Greg Robertson said. He said a four-year-old girl, also critically injured, has been flown to Starship children’s hospital in Auckland. Brenton Tarrant, a 28-year-old Australian man, appeared in the Christchurch District Court today charged with murder. He entered no plea and was remanded in custody until April 5, police said. They are still assessing whether two other arrested people were involved in the attacks. Ardern said Tarrant has traveled around the world with sporadic periods of time spent in New Zealand. He was not a resident of Christchurch and most recently lived in the southern city of Dunedin, she said. He was a member of the Bruce Rifle Club in the south Otago town of Milton, New Zealand media outlet Stuff reported. Tarrant spent an extended period of time in Turkey and authorities “are currently investigating the suspect’s movements and contacts within the country,” the Turkish government said in a statement. He may also have traveled to countries in Europe, Asia and Africa, it said. Tarrant posted a manifesto online before the attack, suggesting a racially motivated act of terrorism. In a rambling document that’s dozens of pages long, he says he was inspired by Norwegian terrorist Anders Behring Breivik, who was responsible for the deaths of 77 people in 2011. Ardern said police have recovered two semi-automatic weapons, two shotguns and a lever-action firearm. The accused had a category-A gun license which meant he could legally buy the weapons he used, she said. The national security threat level has been lifted to high from low, and while authorities have no reason to believe other suspects are at large, they said it shouldn’t be assumed the danger has passed. Police have asked all mosques nationally to shut their doors and advised people to refrain from visiting them until further notice. The events have shocked New Zealand, a peaceful nation in the South Pacific where gun violence is relatively rare. The death toll makes it the country’s worst mass shooting since a prisoner of war camp riot in 1943, which killed 49. President Donald Trump said he spoke to Ardern and told her the U.S. stands in solidarity with New Zealand and offered any assistance. He joins leaders from around the world expressing their sympathies, including U.K. Prime Minister Theresa May, Queen Elizabeth and Pope Francis. New Zealanders around the country and overseas gathered in quiet vigil and prayer, while people in Christchurch began leaving flowers near the two mosques. In London, people gathered at the New Zealand memorial in Hyde Park and flags were lowered to half-mast on government buildings. Christchurch Mayor Lianne Dalziel urged the city to show its support for affected communities and to remain vigilant. Events such as a cricket Test match against Bangladesh and a concert by Canadian singer Bryan Adams have been canceled in the city. The attacks were “an act of cowardice,” Dalziel told reporters on Saturday.